This article is about the plain in South Australia. For the wine region, see Adelaide Plains wine region. The Adelaide Plains (Kaurna name Tarndanya) is a plain in South Australia lying between the coast (Gulf St Vincent) on the west and the Mount Lofty Ranges on the east. The southernmost tip of the plain is in the southern seaside suburbs of Adelaide around Brighton at the foot of the O'Halloran Hill escarpment with the south Hummocks Range and Wakefield River roughly approximating the northern boundary. Aerial view of the Adelaide metropolitan area viewed from above the northern suburbs at the bottom of the image. The city centre is the cluster of buildings in the centre, the Adelaide Hills are centre-right, the eastern suburbs on the far left and the southern suburbs far centre. 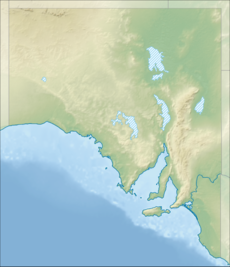 Northwest regions of the Adelaide Plains. The built-up area in the bottom left corner is Greenwith. The dark dotted areas in the background are the northern suburbs of Adelaide, corresponding to the City of Playford centred around Elizabeth and the mid-area of the Adelaide Plains are further in the background. Traditionally entirely occupied by the Kaurna (indigenous) people, the Adelaide Plains are crossed by a number of rivers and creeks, but several dry up during summer. The rivers (from south to north) include: the Onkaparinga River, River Torrens, Dry Creek, Little Para River, Gawler River, Light River and Wakefield River. The plains are generally fertile with annual rainfall of about 460 mm (18 in) per year. The plain can be roughly divided into three parts. The southern area is now covered by the city of Adelaide, the capital of South Australia. The central area is considered the breadbasket of South Australia with many market gardens and wineries, particularly around the towns of Virginia and Angle Vale. The northern area is predominantly used for growing cereal grains such as wheat, barley, and canola, and farming sheep. ^ "Search result for 'Adelaide Plains'". Property Location Browser. Land Services, Department of Transport Planning and Infrastructure, Government of South Australia. SA0000253. Retrieved 10 August 2015. ^ History SA and Department of Education and Children's Services. "Adelaide Plains". Government of South Australia. Retrieved 9 November 2014. This South Australia geography article is a stub. You can help Wikipedia by expanding it.